While the Seattle Storm appear to be pulling away at the top of the WNBA standings, the other seven teams that hold playoff spots form a messy logjam. Two of the seven, the second-place Atlanta Dream and seventh-place Minnesota Lynx, meet Sunday at the Target Center in Minneapolis. The Dream’s lead over the Dallas Wings, who currently hold the eighth and final playoff spot, is three games. Atlanta (17-10) is one game ahead of third-place Los Angeles. The Lynx (15-12), who have a one-game advantage on Dallas, are within a half-game of the three teams directly above them. Fowles has been the lone bright spot for the Lynx in back-to-back losses coming out of the All-Star break. She had 20 points and 16 rebounds in Seattle on Friday as the Lynx lost 85-75 to the Storm, who became the first team to clinch a spot in the 2018 postseason. Fowles was the only Minnesota player to score in double-figures in a 79-57 blowout loss to the rival Los Angeles Sparks on Thursday. For a team that had averaged 26.5 wins over the past seven years, jockeying for playoff position near the bottom of the pack is new territory. 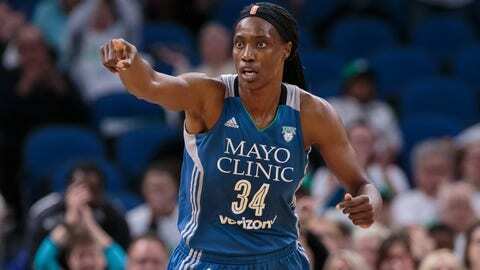 But Lynx coach Cheryl Reeve said her team’s focus needs to remain on the court. “The up and down of the day-to-day, we’re not going to ride that rollercoaster,” Reeve told the (Minneapolis) Star Tribune. “It’s evident that anybody can still finish first. Atlanta returned to its winning ways Friday, with an 89-74 victory over the Chicago Sky. That came three days after the Dream’s eight-game win streak was halted by the Washington Mystics. Dream point guard Renee Montgomery on Sunday makes her second trip to Minneapolis since leaving the Lynx for Atlanta over the winter. Her championship experience might be rubbing off on her teammates.